Edraw comes with a range of Export options that will save you endless hours sat at the computer. Edraw can effortlessly turn your diagrams into pdf, svg and web pages, or even export to MS Word, Excel, or PowerPoint files. Here are some basic tutorials to demonstrate how to export Edraw diagrams to MS Office documents. The Office export feature exports your diagram in graphic format to Word, Excel or PowerPoint. If you want to export the data in the diagrams, please follow these steps. On File menu, point to Export & Send, and click Office option. The MS Word document window will be embedded into the Edraw program and the current diagram will be exported to a blank MS Word document automatically. 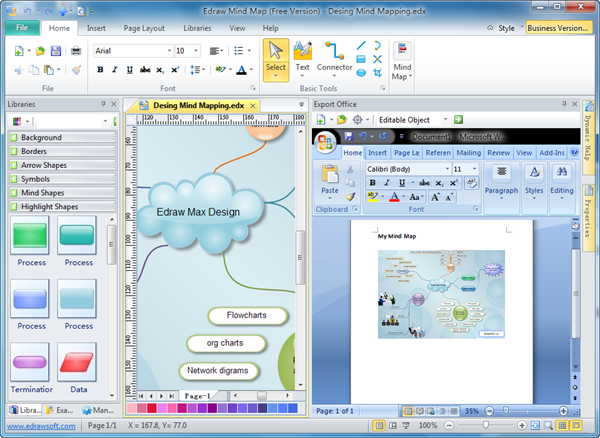 The following image shows the MS Office window layout mode in the Edraw program. There are some options available in the exporting action. Click the first button in the toolbar and the Edraw program will create a blank MS Word, MS Excel MS PowerPoint document. By clicking the open button , Edraw will load an existing MS Office document from the local disk folder. The feature allows the designer to export Edraw diagrams to the cursor position in an existing document. Export all shapes - The Edraw program supports exporting all shapes into an MS Word document with one click. The export size is the outline of all shapes on a page. Not a page size. The blank region will be removed. 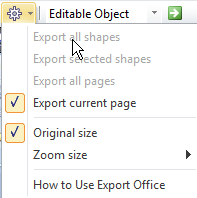 Export selected shapes - The designer can also export only the current selected shapes into an MS Word document. The export size is the outline of all selected shapes. Export all pages - The Edraw program supports exporting all pages into an MS Word document with one click. The export size is the page size. Export current page - The designer can also export only the current page into an MS Word document. The export size is the page size. Zoomed size - The user can use the option to get higher export effect. The designer can choose the export formats from the list above. The Enhance Metafile is better for scalable images and transparent backgrounds. The Windows Bitmap is better for high quality raster images. If the user needs a small size transparent image, the Transparent PNG format is a good solution. Exporting as an Editable Object makes it possible to modify the diagram in MS Word directly. 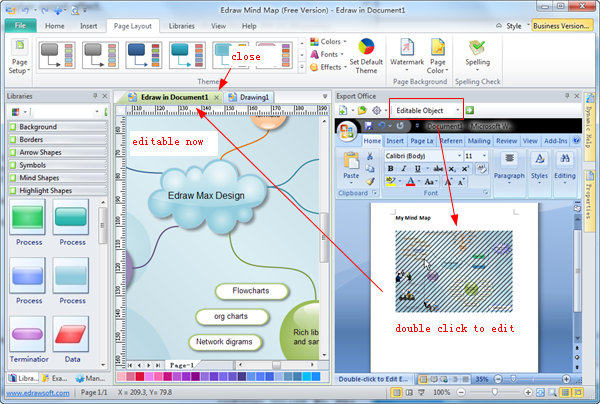 Double click the images in MS Word and the original editable file will be opened in the Edraw program. You can modify the diagram again in the Edraw program. To save the change, click the Close button in the document tab. The designer can export the current diagram to MS Word with the above setting by clicking the Export button . The MS Excel document window will be embedded into edraw program and the current diagram will be exported to a blank MS Excel document automatically. The settings are the same as with MS Word and multiple pages of a document can be exported to the same worksheet. The MS PowerPoint document window will be embedded into the Edraw program and the current diagram will be exported to a blank MS PowerPoint document automatically. The settings are the same as MS Word and multiple pages of a document can be exported in different slides.